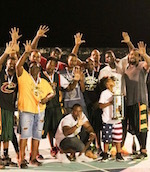 Republic Dominican stay on top of AABA standings. They gained 2-1 record following a 73:56 victory over Outlaws in the latest round. Robert Renfurm posted 17 points and 11 rebounds to lead the winners. Republic Dominican eked out a 24:21 halftime lead. They sank 26 points in the third term to take an 8-point lead heading into the fourth quarter. Republic Dominican followed with a 23:14 rally in the final stanza to ice the win. Moises Oliver had 12 points for the winners. Junior Rogers responded with 18 points for Outlaws as they fell at 1-1 record.